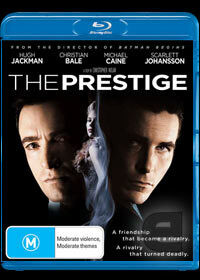 The Prestige stars three Hollywood greats that include Hugh Jackman (Australia), Christman Bale (Batman Begins) and Scarlett Johansson (The Island) in this period drama thriller that is set in the dark backdrop of Victorian London where the boundaries of magic and superstition are blurred. The tale revolves around two magicians, once friends who are now the deadliest of rivalries as each attempts to outdo the other with dangerous costs. Hugh Jackman plays Robert Angier, a first class magician who uses almost every trick in the book to become one of Britain's most famed celebrity magicians. Unlike Robert Angier, Christian Bale plays Alfred Bordon, an everyday man's magician who does not use the "tricks" of the trade, rather more supernatural methods or so they seem that may or may not be real. Although earlier on in the piece, both Bordon and Angier are close friends, something goes terribly wrong which splits their friendship irrevocably and causes this deadly rivalry. Masterfully directed by Christopher Nolan (Batman Begins), this movie is not just your average Hollywood drama/thriller but rather, it's a tale that truly takes the viewer on a rollercoaster ride of emotions, twists and thrills, thanks to the story and the brilliant acting of all those involved. With some state of the art special effects, it's very hard not to get lost in the Blu-Ray version of this film which boasts outstanding quality, both video and audio.